I have a Feedly account to which I login via my Google account. In my Connected Sites, Apps, and Services for Google I see multiple entries for Feedly. I tried revoking access to all of them but one, but after some logins (to Feedly) it again shows up multiple entries. In my case at max I have seen 6 entries of Feedly. What is the reason for this? 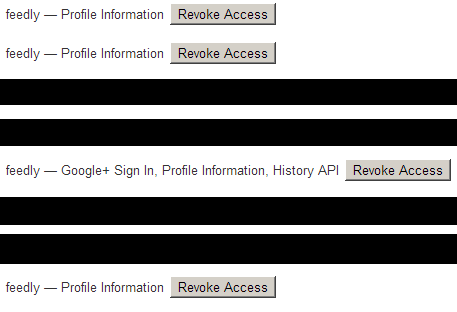 Also every time Feedly asks me for permission to access my Google account information, which I grant. But this does not happen with other accounts like StackOverflow. Browse other questions tagged google-account security feedly or ask your own question. How does one check what websites a person logs into using their Google account?